Did some booth setup and attended a session by Naresh Jain of Thoughtworks and Micah Martin (yes, Uncle Bob’s son) on Acceptance Test Driven Development, where they described a lot of patterns and best practices in ATDD and using FitNesse. Some of the main ideas: write independent tests, don’t put everything in one big test, cleanup and teardown after your tests, avoid repeating by using includes, and don’t have too long of a feedback loop when using a build tool like Cruise Control – try out open source products like ProTest to get you feedback on your checkin within 5 minutes. In the evening we checked out the ice-breaker in the ballroom and had a good chat with Rick Mugridge, the creator of Fit library. 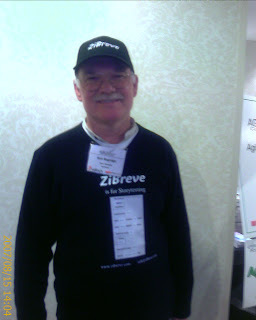 He was a walking booth with his ZiBreve shirt and hat – the shirt even had screenshots. From my booth I could see a bit of the keynote by Susan Ershler. I spoke to her afterwards and got her book for my husband – she’s pretty inspiring. She and her husband were the first couple to climb the Seven Summits, including Everest. On her quest up Everest she had to try it a couple times, and go up and down to camps so the basic idea was sometimes to reach new heights you gotta do a bit of backtracking, and struggle long and hard. Then I worked the booth. A fellow Canadian I met in the café suggested I attend the session on Google’s Agile Adoption and I wish I had – I heard it was excellent. Then in the afternoon, I checked out the leadership symposium in the South Ballroom. Saw 2 good talks, one on Agile Memes (successful Agile patterns basically) by Steve Baker and Joseph Thomas from DTE Energy and one on Enterprise Agile at Yahoo by Gabrielle Benefield. Steve described how they got their big energy company using Agile by slowly phasing it in, trying on pilot teams, and getting teams to volunteer to try out scrum. They did their scrum meetings in the cafeteria and were open to people listening in, and made it fun by dubbing it “Big Pop Time” (someone started a trend of getting a huge pop and making scrum a fun break in the day.) Gabrielle described how she similarly piloted scrum at Yahoo and got mass appeal by giving out cute Agile t-shirts, hiring very outgoing Agile coaches, making it a defacto almost subversive process rather than mandated. She basically made scrum and Agile cool, and it spread around Yahoo. I went to Gabrielle Benefield and Michael Holzer’s session on User Centred Design for Agile projects. They described their unusual research methods for finding out what users, in their case teenagers, wanted out of products and creating user profiles to help understand their target market.In “Agile Ghettos or Thriving Communities”, Chris Avery and Michael England presented the idea that we should have Agile methodologies move beyond product development departments up to the executive level. There is a divide between these levels, and having a scrum of scrums and more collaborative work between executive could bring productivity gains. They described many case studies of this working at unique companies, including WL Gore (they make Gortex). And Friday we flew home. It was an exhausting week and I did a lot of demos of FITpro and got some feedback, but that will be the topic of another blog post. See you at Agile 2008 in Toronto!